Fleas are harmful parasites that severely attack animals and humans. They are the source of many diseases and transmit other serious skin conditions. Fleas are present worldwide and affect pet health greatly. Being omnipresent, they are difficult to control but knowing their anatomy and life cycle, pet owners can protect their furry friends from these nasty pests. Forming the order of Siphonaptera, Fleas are external parasites that are 2-8 mm long with their body divided into three compartments. The three parts are the head, thorax and abdomen. Three pairs of legs are attached to the thorax and abdomen. The last pair is hugely enlarged, which aids them in their jumping ability. Flies are agile and normally dark colored with tube like mouthparts adapted to feed on their hosts. They are wingless insects with literally flattened body and are smaller than a sesame seed. Fleas are bloodsuckers. Both male and female fleas feed on the blood of animals. Blood is their only meal and necessary for their different life stages. But, can survive in extreme conditions for several months without food during their transforming stages. Being homometabolous insects, fleas go through four life stages – egg, larva, pupa and imago (adult flea). Before being capable of reproduction, adult fleas must feed on blood. When the male and female fleas mate, two days later female fleas lay eggs. 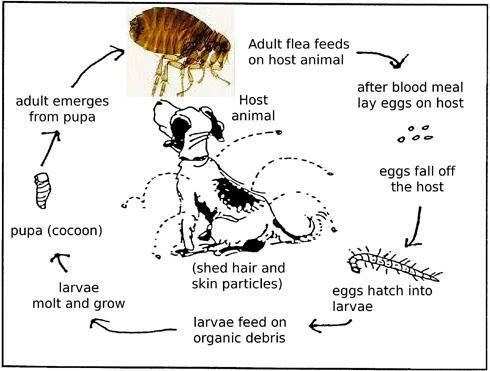 In a day, fleas lay 30 to 50 eggs. In batches of 20 or so, eggs are laid on the host, which can easily roll down onto the ground. Because of this, areas of host’s dwelling like resting place, and where they roam are the primary habitats of eggs and developing fleas. Larva emerges from the eggs and feed on any organic material like feces, dead insects and vegetable matter. When on host, they evolve feeding on the blood. They remain in darkness to avoid sunlight, thus inhibit in dark places like crevices, cracks, sand, bedding and animal fur. With adequate food supply, larvae weave into cocoon for 1- 2 weeks. Spending another week into cocoon, the adult flea emerges out as pupa from cocoon. During this stage, they normally rest and wait for the host to pass by to jump on them and start sucking blood to develop fully. In larval and pupas stages, fleas usually overwinters. Feeding on host, pupae evolve into adult fleas and ready to reproduce. Newly emerged adult fleas cannot live longer than a week in lack of a blood meal. However, when they are in pupal stage, they can survive for several months. If you find your pet has those nasty parasites dwelling and sucking blood, start flea and tick treatment immediately. There are numerous anti-flea medications available in the market. For heavy discounted flea preventives and treatments, visit our online store with stock of leading brands.